The Young Lawyer’s Division is back! Starting this Friday April 26th from 5-7pm and each Friday thereafter at Nightshop in downtown Bloomington, all lawyers age 36 and younger or those with less than ten years in the practice of law are invited to a weekly social. The young lawyers don’t want to discriminate, so feel free show up if you are a lawyer that feels within your heart that you are 36 and younger! The Central Illinois Fellows Reception was held at Bloomington Country Club on April 18th honoring Bill Allison, Guy Fraker, Darrell Hartweg, John Luedtke and Ralph Turner. The turnout was great and we all received a wonderful history lesson from the attorneys that introduced the honorees and the honorees themselves. All of us that practiced law with these fine gentlemen are very lucky indeed. Speaking of history, at the the May 21st monthly luncheon we will get to hear some humorous law practice stories from some of our more “experienced” attorneys and judges. It should be great. If you have a short story that you think we all might enjoy, please let me know and we will add you to the program. Unfortunately, CLE credit will not be available for this program but you will still want to attend. Please register to attend below. Don’t’ forget to sign up for the Law Day Luncheon on April 30th. Today is the last day to register. The sign up is below. On May 2 from 5-8 pm at Destihl Brewery, your bar association is helping to sponsor Prairie State Legal Services’ “Lawyers for Justice Celebration.” Live music will be provided by George Boyle’s band “Twilight Zona.” It should be a great event. Please see the registration to attend below. The MCBA is accepting nominations for its 2019 Young Lawyer of the Year Award. In order to be considered for the award, one must be (1) under the age of 36 or less than 10 years in practice, and (2) a member in good standing with the McLean County Bar Association. Evaluation criteria include employment history, individual achievements in the practice of law, service to the MCBA, and community/pro bono service. legal advice fair - volunteers needed! 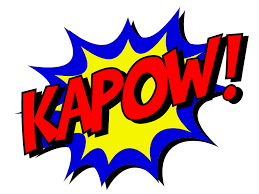 Register by clicking on the KAPOW! button above. See below for location, time and registration information. Please RSVP with the list of names and email addresses of those who will be attending to Peggy Barnes at Margaret.Barnes@pnc.com. If you provide an email addresses we will add those to our direct monthly invite list. There is not a cost for the seminar or lunch except we request you stay for a brief presentation by Wealth Management. The entire program will conclude by 1:00 p.m. Earn 1.5 hours of Continuing Legal Education Credit for Illinois and other states. Continuing Education Credit also given for CPA, CTFA, CFP, CLU, ChFC. Remember to have “Breakfast with the Bar” every Friday morning between 8:00 am and 9:00 am. It’s a great way to meet and talk with your fellow attorneys in an informal setting. Stay for 10 minutes and have a cup of coffee or stay for an hour and have a full breakfast before court. Grab an associate, partner or friend and come. See you Friday!